As soon as rail transport systems began to be electrified, SOURIAU developed connectors which were specially adapted to the needs of the railway industry. SOURIAU will be exhibiting at InnoTrans, the international transport technologies fair, held from 18 to 26 September in Berlin. SOURIAU connectors are used in rail transport systems all across Europe, Asia, and the continents of America and Africa. This widespread international presence is the outcome of the long-standing collaborative relationships which SOURIAU has established with major players in the rail industry sector such as Alstom, Faiveley, Knorr-Bremse, Hitachi, Mitsubishi and others. In Japan for example, 80% of SOURIAU's sales are interconnect solutions for rail transport companies, and they take pride in the fact that many of the country's high-speed trains and metros are equipped with SOURIAU railway connectors and systems. The recognition of the excellence of SOURIAU connectors by these major customers opens the door to other markets. Jérémie Chang, Rail Transport Product Manager: "We are present in two main types of applications: the on-board equipment of trains, metros and trams and the equipment for track signalling and in the rail traffic regulation and control centers. Our connectors have to be very robust and resistant to shock, vibration and extreme temperatures and the plastic parts must be fire resistant in line with the EN45545-2 standard. To ensure that our products comply with the specifications of the standard, we test the plastic components of our connectors for fire resistance, flammability and the toxicity of the emitted smoke." Connectors play an important role in ensuring the safety and reliability of railway equipment, whether it is in the rolling stock or in the stationary installations for control and signalling. With the increased use of electronics, new requirements arise. Paying constant attention to what customers need, SOURIAU adapts its product range and designs new solutions. On its stand at InnoTrans, SOURIAU is showing one example of a close collaboration with a customer, in this case a project for Knorr Bremse: a braking system equipped with SOURIAU connectors. When Knorr Bremse enhanced the architecture of its new braking systems, SOURIAU successfully adapted its connectors to meet the new requirements. By working closely with the design department of Knorr Bremse, SOURIAU was able to develop connectors with the rear body modeled to fit within the space constraints of the new enclosure designed by Knorr Bremse. SOURIAU applies this approach when interacting with all its customers: a partnership between teams to clearly understand the requirements and to provide solutions which correspond to the needs. Jérémie Chang: "The main reasons why our connectors are chosen by our customers in the rail transport industry, is the high level of product reliability, the efficiency of our logistics and because we are passionate about rail transport. Our guiding principle for our work is to be open and cooperative and allow the development of new solutions that meet our customers’ expectations. The VGE1 series, mainly used in rolling stock applications which have to meet very tough vibration and shock specifications. The SMS series of monolithic, all-plastic, rectangular connectors. The MSG3U series of rackable, rectangular connectors for signalling systems. The MSG3U connectors have the advantage having a metal lever which makes them easy to connect and disconnect while still guaranteeing high reliability. Follow this link to find out more about our solutions for railway connectors. Jérémie Chang: "The world of rail transport is evolving very quickly. In TGV and TER trains, metros and tramways, new passenger comfort requirements need to be provided for, with services like Wi-Fi and the distribution of increasing volumes of passenger information. Transferring more and more data has become the order of the day. 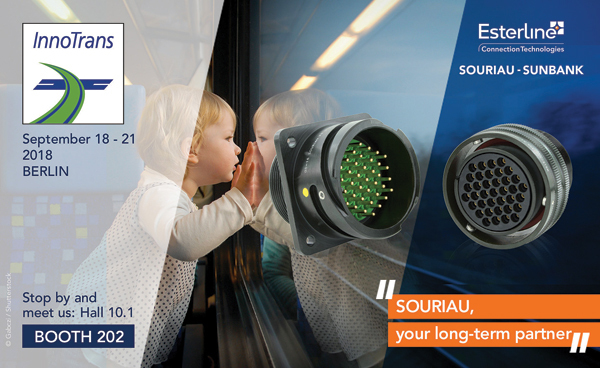 Fibre optics, which is already used in rail transport, will become more important in the future and SOURIAU's experience in this field means we are able to offer our customers optical connectors adapted to the constraints of the industry."